TE: What is your name, where are you from and what do you do? DIEGO: My name is Diego Pappalardo. I’m from Italy, I live in Shanghai, work for a European Bank and teach capoeira. TE: Can you describe capoeira for us? DIEGO: Originating in Brazil in the 1600s, Capoeira is the only indigenous American martial art, it was developed by African slaves in Brazil. Capoeira began to take form amongst the community of slaves that worked on the sugar cane plantations. It became a strong weapon in the life and death struggle against their oppressors. Capoeiristas learned to camouflage the forbidden fight with singing and clapping as though it were simply entertainment.The fight was disguised behind the dance – a dance that could be as graceful as a panther and as treacherous as a snake.Capoeira is an art form and self-defense; with strong aerobic and dance elements. It is a harmony of forces that gives you power, flexibilty, endurance and self-discovery. Capoeira balances the body, soul and mind. It is a graceful, exciting art form that teaches you to be alert. TE: In China, how would you compare capoeira to other martial arts? DIEGO: Capoeira is less martial, more creative. It involves music and history. It is a great workout and is demanding, even though the environment is friendly and students have fun during the training. TE: Capoeira is often seen performed without much physical contact. Is that by design? DIEGO: As some Capoeira Master said, “There is no physical contact if you’re fast enough to avoid the kick.” The first thing that a capoeira student learns is to escape from kicks. The second thing is to kick with control. Our goal is not to hurt the opponent but to challenge him and to dialogue with him. 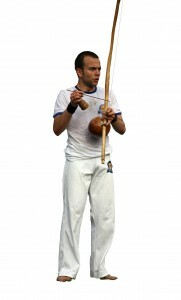 We say “to play capoeira”, even though there is a challenge and there can be contact. TE: How long have you been in China and what’s it been like there for you as a foreigner? DIEGO: I have been in Shanghai since 2005, while I had also been in Beijing as student in 2004. I have now a full time job and a full time commitment to teach capoeira: I love my life here and as a foreigner who can speak mandarin I find the life in Shanghai pretty easy and convenient. TE: If you had one tip for someone visiting China, what would it be? DIEGO: If you’re visiting, be Chinese: eat Chinese food, visit the parks, the narrow streets, go to Beijing and have just a quick look at Shanghai. If you’re moving here for long term, then take this opportunity to realize your projects: China is the right place to do that.